Worsted suit, town shoes, fancy rib lisle hose. 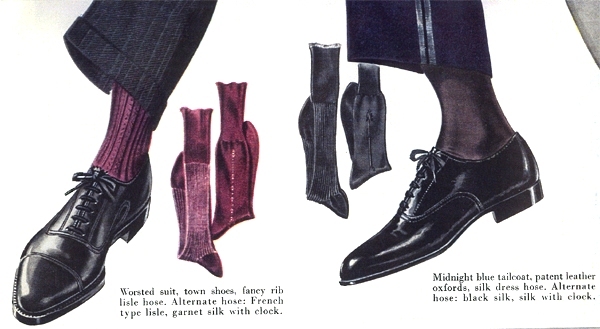 Alternate hose: French type lisle, garnet silk with clock. Midnight blue tailcoat, patent leather oxfords, silk dress hose. Alternate hose: black silk, silk with clock. 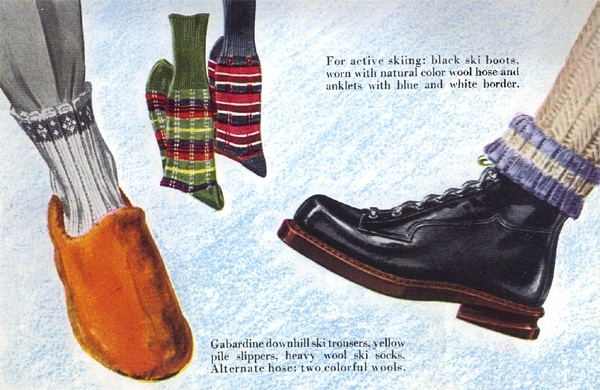 For active skiing: black ski boots, worn with natural color wool hose and anklets with blue and white border. Gabardine downhill ski trousers, yellow pile slippers, heavy wool ski socks. Alternate hose: two colorful hose. 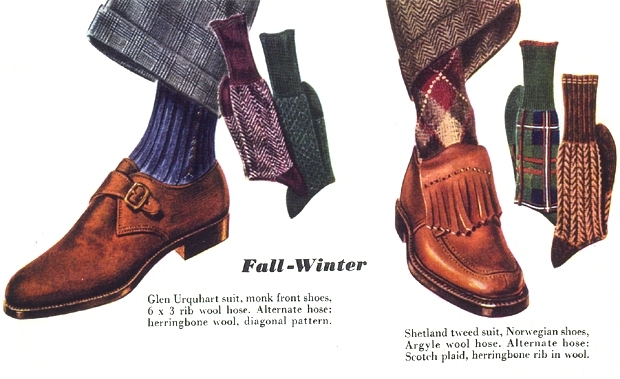 Glen Urquhart suit, monk front shoes, herringbone wool, diagonal patter. Shetland tweed suit, Norwegian shoes, Argyle wool hose. Alternate hose: Scotch plaid, herringbone rib in wool. 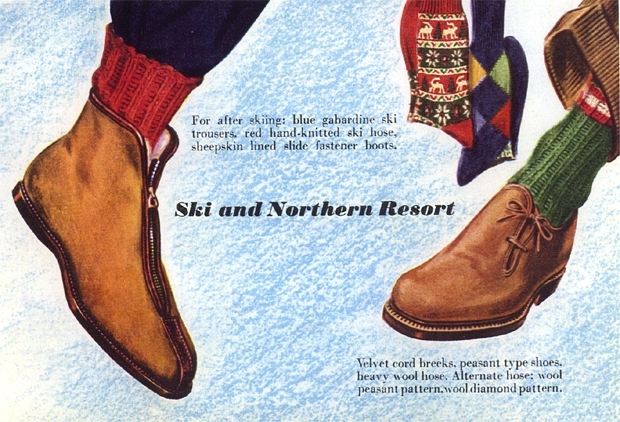 For after skiing: blue gabardine ski trousers, red hand-knitted ski hose, sheepskin lined slide fastener boots. 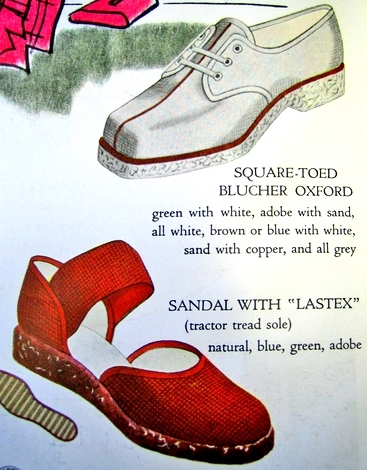 Velvet cord breeks (Scots for trousers), peasant type shoes, heavy wool hose. Alternate hose: wool peasant pattern, wool diamond pattern. 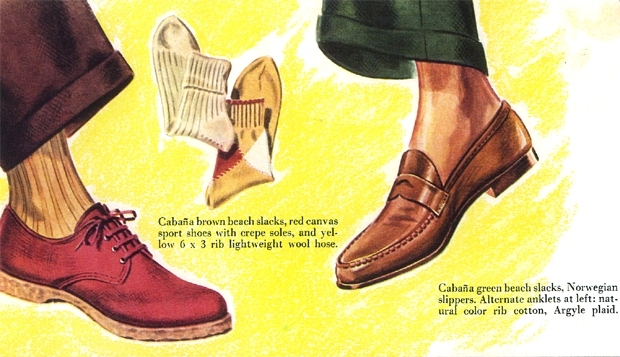 Cabana brown beach slacks, red canvas sport shoes with crepe soles, and yellow 6 x 3 wool hose. Cabana green beach slacks, Norwegian slippers. Alternate anklets at left: Natural color rib cotton, Argyle plaid. 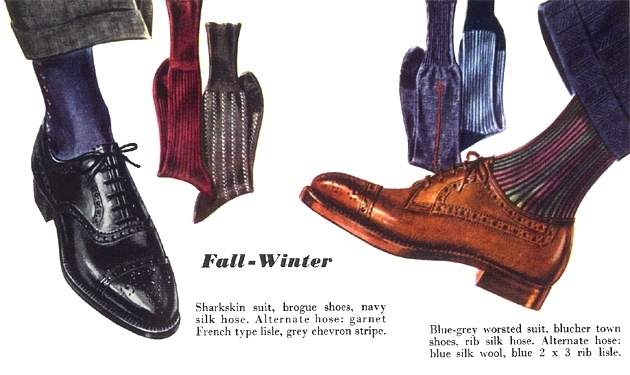 Sharkskin suit, brogue shoes, navy silk hose. Alternate hose: garnet French lisle, grey chevron stripe. 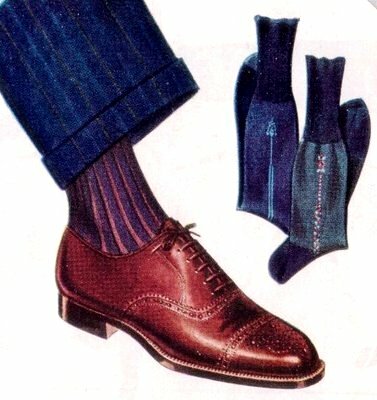 Blue-grey worsted suit, blucher town shoes, rib silk hose. Alternate hose: blue silk wool, blue 2 x 3 rib lisle. Rubber beach sandals, terrycloth robe. 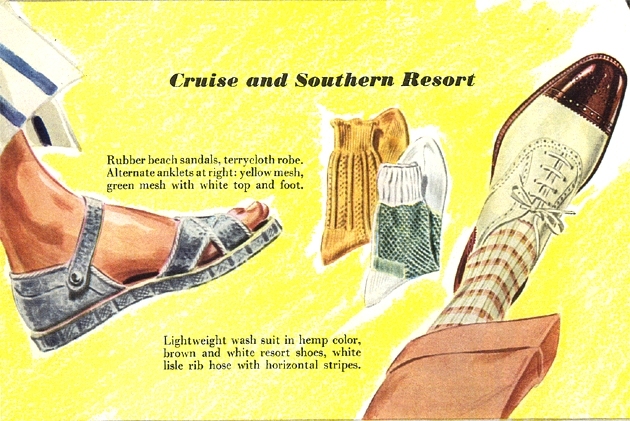 Alternate anklets at right: yellow mesh, green mesh with white top and foot. 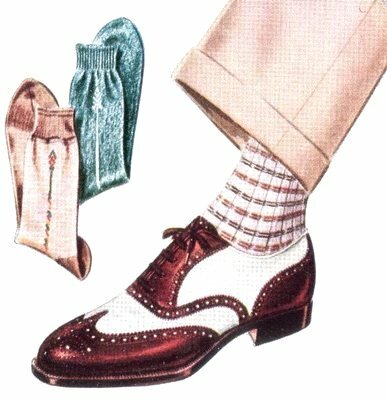 Lightweight wash suit in hemp color, brown and white resort shoes, white lisle rib hose with horizontal stripes. Tweed suit, Norwegian shoes, wide rib hose. Alternate hose: blue wool with plaid motif and antique Argyle wool. 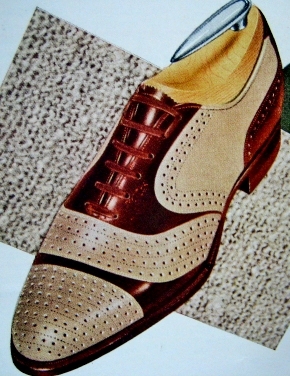 Cheviot suit, wing tip brogues, cable pattern hose. Alternate hose: camel color wool, Scotch plaid wool. 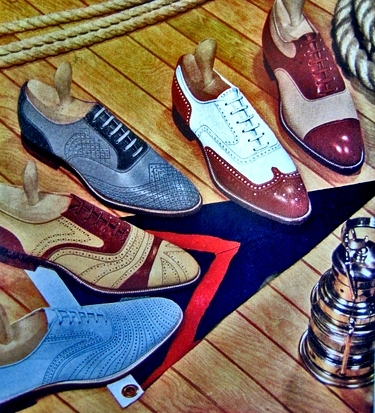 Thats a hell of a collection, but for me the white shoes with the big brown stitches and the blue suede jobbies with the insane punc-work take the cake. You’re a real dandy, bra. 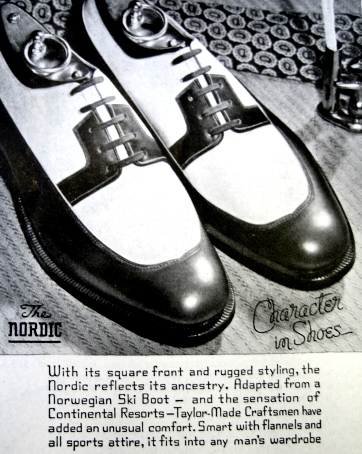 I like that the penny loafers are called ‘Norwegian Slippers’. 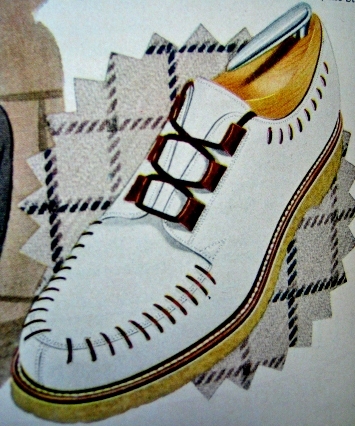 I also cant help but think how fun the Norwegian kiltie shoes look. 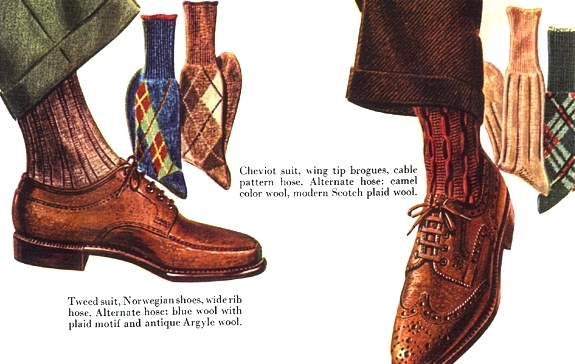 Many of the shoes are still available today, but what about all of those socks? 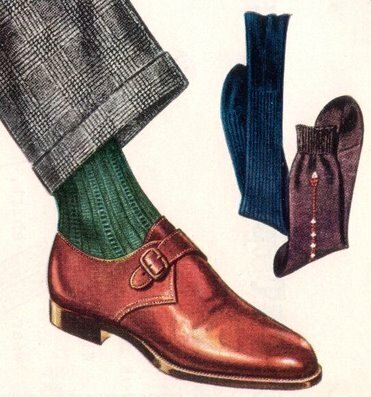 What is the year of this Esquire…1930s? I too love a good kiltie. I don’t have the dates of the ads, but they certainly have that 1930s flavor.